I have had several occasions to mount a naked hard drive mechanism into an enclosure of some sort so that I could plug it in to one or another of my machines. With hard drive capacity available for not much more than $1 per gigabyte, extra hard drives can be handy things to have around. This article demonstrates how anyone who can use a screwdriver can install a bare hard drive into an economical case and thereby gain some extra storage at a moderate price. Figure 1 - Cooldrives Clearlight compact external 2.5 inch enclosure with drive installed. 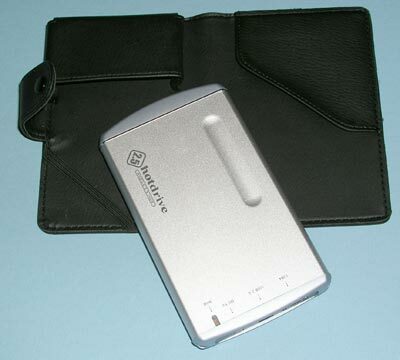 Laptop computer users will find a compact external hard drive like the ones pictured in Figures 1 and 2 to be very handy in a number of ways. Both units are about the size of a fat checkbook, which means they do not take up too much room in a suitcase or in one's laptop case. 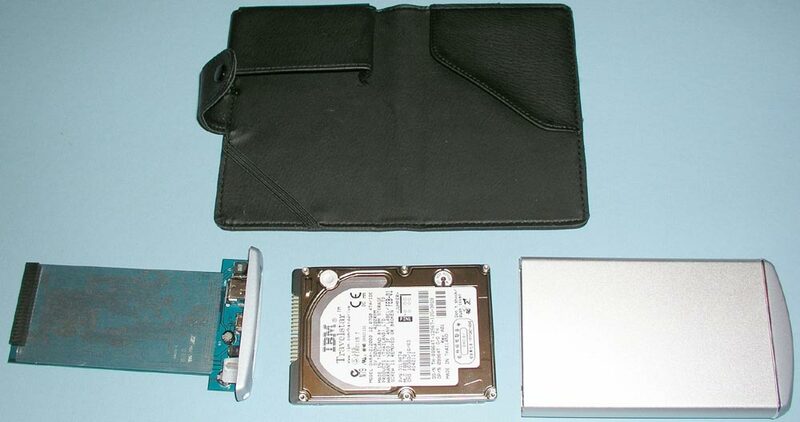 The black object in Figure 2 is a carrying case that provides a certain amount of padding that may protect the drive if it is not dropped too severely. Figure 2 - Hotdrive 2.5" Mobile enclosure. 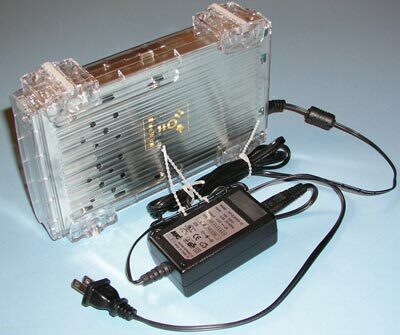 Figure 1 shows a "Clearlight" enclosure that I found at http://www.cooldrives.com/. The unit in Figure 2 is a "hotdrive 2.5 mobile" model from the same source. Figure 3 - Hotdrive 2.5" Mobile enclosure, disassembled. Figure 3 shows just how easy it is to install a drive mechanism in the enclosure of Figure 2. The pins on the drive slip into the connector on the end of the circuit board. The IDE to 1394 converter chips are on the back side of the PC board. The PC Board with drive mounted on it simply slips into the aluminum case and two tiny Phillips-head screws (Figure 4) hold everything together. This enclosure only accepts 9 mm thick drives. The one in Figure 1 will also accept the older 12 mm thick drives. Figure 4 - Rear view of Hotdrive 2.5” Mobile showing external connections. Figure 4 shows the ports for the interface cables and DC power on the "hotdrive" unit. The drive requires some help with DC power when connected to USB. The USB cable is special with two "A" plugs on the computer end and a min-USB plug at the drive end. These provide enough power if the unit is connected to a powered hub, as it was when I tested it. The kit comes with a small AC adapter that can be used in other situations. The Clearlight model in Figure 1 has a selector switch that allows the user to control whether power comes from the bus or from the AC adapter. This is especially handy with some older Macs that do not supply power through the FireWire port or where the ports are heavily loaded. Those who have upgraded the hard disk capacity on their laptops can install the low-capacity drive they started with into an enclosure and put it to work for a number of useful tasks. Road warriors ought to have some kind of a convenient backup medium and an external boot device for emergency use. Laptops are vulnerable to theft and to damage from rough handling and accidents, so that extra care must be taken to keep them backed up. I have a 2 GB drive that stores a Mac OS 9 system so that I do not need to have Classic and its applications taking up space on my iBook. I can launch Classic from the external FireWire drive whenever I need it (which is very seldom these days). Another 2.5 inch external drive carries my music collection so that I can save that space on my main hard drive. Altogether I must have 6 or 8 compact external FireWire drives that I use for different things. In the old days some people regarded tape as the medium of choice for backing up hard drives. The capacity of the tape was much greater than that of most hard drives and the storage was very compact. However, the tape medium was pretty unreliable for long-term storage and we were thankful when magneto-optical storage came along. At prices in the $1 per gigabyte range modern hard drives seem to offer an excellent combination of durable storage and easy access. Just as we used to keep our 68K and early PowerPC desktop computers backed up on SCSI drives in the old days we can now treat our Power Mac G3, G4's and G5's to the same tender loving care at a more modest price. While there is room for extra drives in the internal bays of newer machines, there are still good reasons for pulling an external FireWire drive out of the drawer and cabling it in. 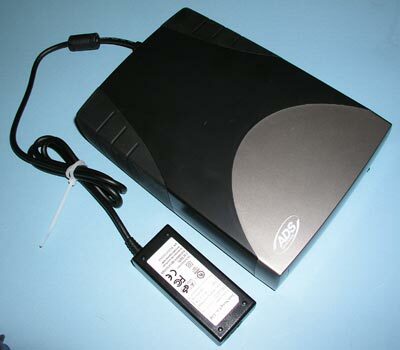 Figure 5 - ADS Technologies enclosure for 3.5" hard drive. Multimedia projects take up lots of drive space and it is nice to archive them in a convenient form if one wants to work on them later. A hard drive in an easily disassembled enclosure is nearly the functional equivalent of a large removable drive. Figure 6 - Cooldrives ICE-clear 3.5" drive enclosure. Two examples of 3.5-inch drives in user-accessible enclosures are shown in Figures 5 and 6. I think the built in fan provided in the ADS Technologies unit (Figure 5) is a distinct advantage, as the unit in Figure 6 runs rather warm to the touch. As can be seen from Figure 7 the USB port on the ADS Technologies (Figure 5) unit allows for the use of an ordinary A to B cable. Figure 7 - Cooldrives ICE-clear 3.5", view from rear. The USB capability of the ADS Tech unit has proven useful in backing up data from a Windoze laptop that I scrounged up for research purposes. I expect to use it quite soon for some maintenance work on an iMac that lacks FireWire. 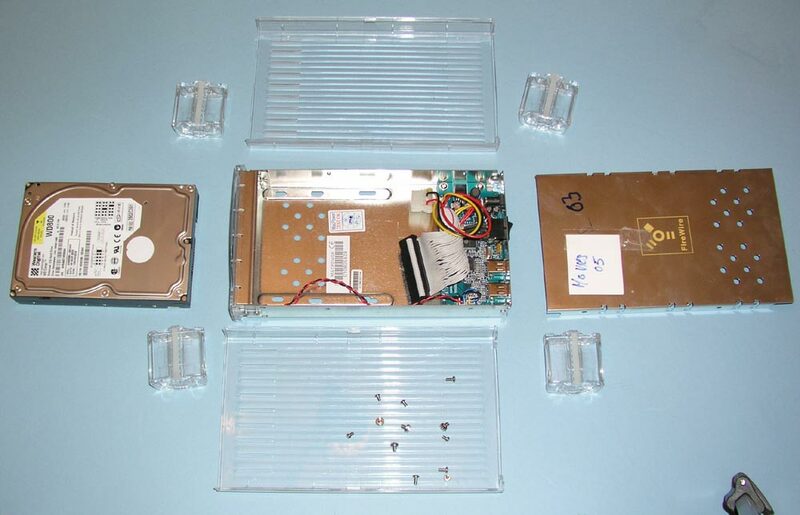 Figure 8 – Cooldrives ICE-clear 3.5", disassembled. The exploded view of the Ice-Clear unit shown in Figure 8 reveals once again the basic simplicity of these kits. The interface electronics are on the assembly in the center of the picture. One needs only to connect the ribbon cable to the drive pins and the power connector to the appropriate jack. Once the drive is seated over the holes in its mounting base it can be screwed down. The shield assembly at the right of Figure 8 can be screwed to the rest of the assembly and the clear plastic case can be fastened on with a few more screws. Most of my 3.5 inch drive mechanisms are not in an enclosure at any given time. Since it is awfully tedious to mount one drive after another to examine its contents, I keep a catalog of the files on the drives. The shareware DiskCatalogMaker by Fujiwara Katsuya is a great tool for this purpose. Before anyone goes trucking off to buy an enclosure, let's note that high capacity external drives are now quite cheap. If one needs a single drive for simple everyday backing up it might be best to buy a preassembled unit because the price is often less than the combined price of an enclosure and a drive mechanism. 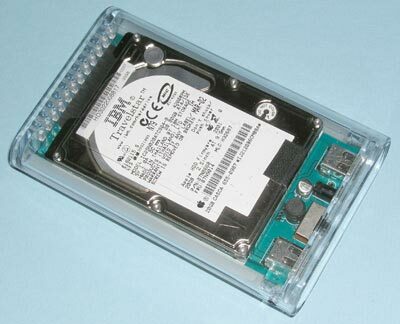 Some manufacturers package hard drives in the kinds of user-accessible enclosures described above. It might be worth seeking these out if you think that your later needs will be served by the “one enclosure holds all” model. If, on the other hand, you find that you have a hard drive that needs a home, by all means put it into an enclosure so that you can use it. As drives get bigger and bigger you can put your archived stuff on the current drive and swap it out for a new large economy size at a very modest price. The one enclosure for several drives approach makes for more compact storage because one does not need to save all of those power bricks and cords. Nowadays you will want to get enclosures with both USB and FireWire capability. While FireWire is the nicer interface, having the USB option makes life more convenient with some older iMacs and Windoze machines. You will want to be sure that whatever enclosure you use can get adequate power. Some older machines do not supply adequate power, particularly on the USB bus. 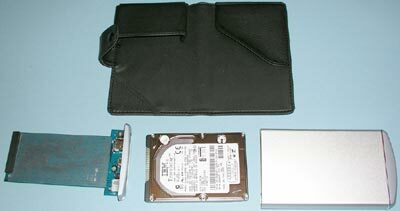 Some add-on cards for older laptops do not supply any bus power at all. I have not specified models and prices in this article. The enclosures illustrated here are intended only as representatives of their breed, not necessarily the best choices. I have found Cooldrives.com to be a reliable source of drive enclosures, but places like Microcenter and CompUSA sell them as well. A retired government scientist, John runs JDB Science LLC, a freelance enterprise for scientific work and Macintosh user assistance. Contact him at jdbscience@mac.com.